Upon my arrival to Accra Airport I was welcomed by the two members of OSDA who took me to my temporary residence in Accra, the OSDA house. 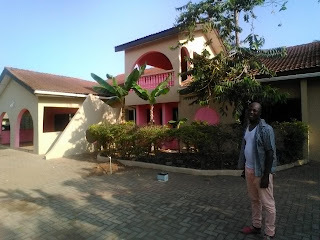 It is a humble place with garden, where you can fetch fresh coconuts, bananas (or rather plantain trees, which produce banana-like fruits, but they are more starchy and less sweet) and mangos. The residents of OSDA house are members of the organization and they have different roles within the organizationˈs structure. My mentors Sarah and Mr. Brown are helping me to understand the work of OSDA and they are introducing me to different aspects of life in Ghana. First thing I learnt during my welcome dinner was that Ghanaians like to eat together from the same plate and they only use hands. It was bit of a culture shock for me as European accustomed to eating with spoon, knife and fork. However, it is the Ghanaians way how to express that they care for each other, something between the lines „sharing means caring“. I was introduced to the making of traditional dish called „fufu“. It consists of soup or stew made of different kinds of meat and mixture of spices and herbs (tastes similar to guláš). The other part of dish is made of cooked plantains and cassavas (root of a plant, tastes like potato but sweeter). It has to be mashed in a wooden mortar using a heavy pestle. The preparation takes quite a long time but the resulting meal is delicious. After few days in Accra I experienced several regulated power cuts. This way government tries to safe money and reduce spending, for example street lights are very rare in the streets of Accra and some parts are regularly suffering from fuel shortages. Without fuel and electricity many business cannot work. I visited the company supplying sachets of drinking water, but the production had to be stopped because of power blackout. People are not happy with the current situation and they hope that the general election in 2016 will bring some positive changes. 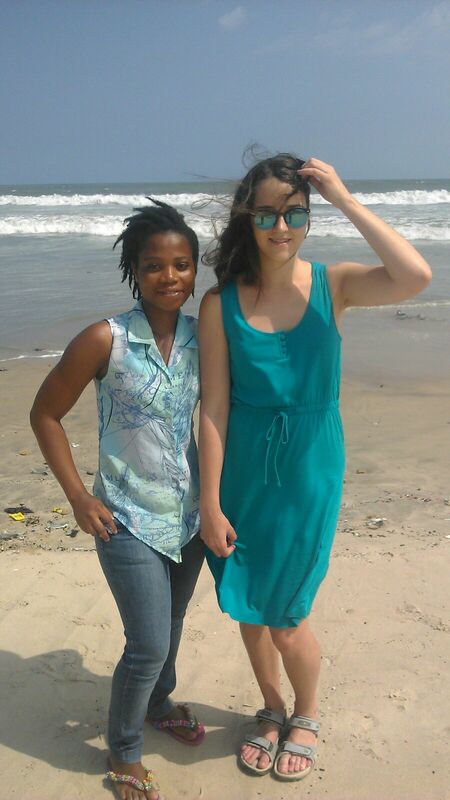 I was struck by how courteous Ghanaians are. They ask a complete stranger to join their dinner (this has happened to me multiple times) and they don't want anything in return. 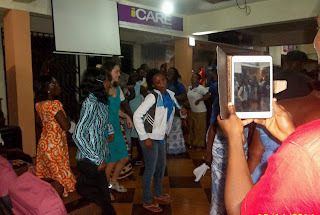 Ghanaians are very sociable, they like to dance and play music till the early hours of the morning. I joined drum festival, where people were dancing to the rhythm of drums. The room was extremely hot and steamy nevertheless it was a unique experience. 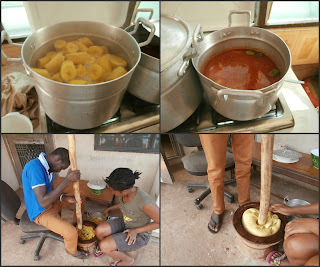 Making of fufu (mashed cassava, plantain eaten with soup or stew). Inside tro tro, the most popular form of transport in Ghana. work in agriculture. Ghana is the world's second biggest producer of cocoa. was stopped due to the power blackout. with trash and only few places are kept clean for swimming. I saw your sharing on facebook!